in QML, it is possible to change the parent of an item. But with V-play and the cocos renderer, this doesn’t work the way I’m doing it, especially when it comes to the z-order of those items. I have a level which has a grid of tiles, and some other elements. When I load another level, i want to reuse all the tiles in the grid, so i don’t have to destroy all the entities, and then re-create them. But when I do this, all the other items appear on top of the tiles that i have re-used. When I enable the QML renderer, everything’s displayed correctly. So my question is, is it intended to be possible to change the parent of an item in V-play, or do i have to find another way to do this? With t being the tile that is re-used, and level being the new level that is being loaded. So that the cocos item gets loaded, but it still seems the tiles all are under their old parent. reparenting is currently not supported in Felgo. Our games Squaby and Chicken Outbreak use this concept too. EDIT: Didn’t see your post up there. OK I’ll have a look at the pooling, thanks. The problem is that the cocos representation was not created for this item when you call loadItemWithCocos(). The much easier and cleaner road would be to use entity pooling as the entityManager would then take car of all these issues – is that not an option? Pooling seems to give it a good performance boost, but I’m getting some really weird results with z-ordering. Could it be that the sorting of the items isn’t invoked when using them from the pool? So the tiles probably have their old z-index. PS: And with every time i re-load the level, it gets screwed up further. My guess is, that the items are re-used in a random order, and that the z-index doesn’t get sorted correctly (it is set correctly in QML). You set the z value based on your row and column number right? Do you set the new z order when you re-create the tiles for the new level? With the first index being the column, the second being the row. So every row has higher z values than the row above it, and if the item is at a higher level (which is the “3rd dimension” in my game), it’s also a bit higher. But it still looks like in the screenshot. Could you post the source code for your dynamic level creation, and how you remove it? Yes that’s exactly what produced my output that I posted earlier. I think what the problem is, that the items that get loaded from pool don’t get assigned the new parent item correctly, and now they are behind all the other items. Where “base_tile” is the entityType of the grid of tiles that should always be there, and “game_item” are items that can be placed on top of the tiles, like the player and the block you see in the screenshot. 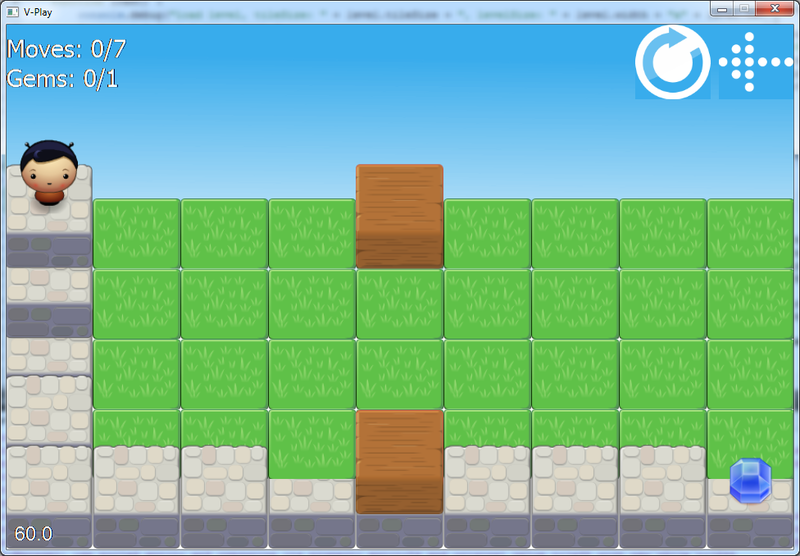 test += "tile at " + t.col + "/" + t.row + ".z: " + t.z + "\n"
Where tile is derived from GameItem, which is derived from EntityBase. With tz being the data which levels the tiles should have, and the children are all items that are derived from GameItem, that are placed into the level on top of the tiles. BaseLevel is the base type for the levels which has some properties like rows and columns for the size of the level, and more. How do you load the dynamic levels – with the Loader element? Also, which entitContainer did you set for the EntityManager? All the entities get placed as child of this element and you should not remove it. So instead of replacing the entityContainer, use the same one. You could additionally use the onZChanged slot for debuggin the z changes, as it indicates when the game.level item might get changed. I made a LevelLoader element which loads the levels like this. It’s from a QT tutorial on how to create dynamic items. All the entities get placed as child of this element and you should not remove it. So instead of replacing the entityContainer, use the same one. Ah so that could be the problem – i always delete the entityContainer and make a new one. Then i should probably try to avoid this? Yes please.. Also have a look at Squaby please, which has level loading of qml files and also by using the storing feature of the EntityManager for user-generated levels.